When a husband tells his wife, or she suspects, that he no longer ioves her she may feel as though her world is ending but in this positive and powerful book, marital therapist Andrew G. Marshall has a message of hope. It is possible to turn a relationship around and emerge with a stronger bond. How to get to the bottom of why he's fallen out of love. What's really going through his mind. Why your husband has turned into a stranger. The signs that show if he's depressed and what to do about it. How to build better communication and start improving your relationship. The six types of other woman, from 'a spark' to 'the love of his life'. Tailored strategies for dealing with each type. Five worst and best reactions after uncovering what's really going on. How to keep calm even when provoked. How to combat the poison that she's slipping into your relationship. It is ten years since the first person arrived in my marital therapy room having told their partner: 'I love you, but I'm not in love with you.' I wrote an article for the Observer newspaper in the UK about couples splitting up, not because they hated each other but because one partner had fallen out of love. The response was overwhelming and I was asked to write the book: I Love You But I'm Not in Love with You: Seven steps to saving your relationship. It turned out to be not just a UK phenomenon: the book has been translated into German, French, Italian, Chinese, Japanese, Swedish, Greek, Turkish—in fact, fifteen languages and counting. I was also the first UK-based self-help writer to be published by HCI Books in the USA (the publishing house behind the bestselling 'Chicken Soup for the Soul' series). Back in 2006, when the book was published, I thought I'd written everything that needed be said on 'I love you, but ….' However, it was aimed at both the person who had fallen out of love and their partner. I didn't cover the differences between when a woman falls out of love and when a man falls out of love, because I didn't want to make generalizations about all women this or all men that. My sample of cases were all couples who were committed enough to saving their relationship to phone up Relate (the UK's leading couple-counseling charity), book an appointment for an initial assessment, and wait the weeks and sometimes months to start on-going counseling. However, desperate letters to my website (www.andrewgmarshall.com) told a different story—about men and women who had told their partners they'd fallen out of love and either immediately or a few days later declared that the relationship was over. They couldn't 'change' their feelings, they needed 'space,' and the children 'should be told.' There was 'no point' going into counseling and if the person who had fallen out of love did ­reluctantly agree, it was only to tick a box that 'we tried everything.' These correspondents had found my book incredibly helpful and drawn hope from my message that 'you can fall back in love again,' but wanted to know how to communicate this to their partner. The more letters I received and the more stories I heard, I began to realize that it was a completely different experience being a man, rather than a woman, being told 'I love you, but ….' Time and again, these men were isolated and didn't know where to turn for support. They had always taken their emotional problems to their wives. They had friends, but they were more likely to offer a beer than advice or a chance to talk. So I decided to write a book aimed specifically at men, My Wife Doesn't Love Me Any More, to help with their sense of isolation, to offer emotional support and to provide a practical program for rescuing their ­relationships. I thought women didn't need a book specifically targeted at them. They have plenty of friends to offer support and, while media aimed at men is full of sport, politics, and business, women's magazines, TV programs and websites are overflowing with relationship advice. However, sometimes, these pluses turn into negatives. Talking to friends can fan the flames of panic and lots of women have told me that they don't want to confide in their friends (who sometimes turn them into a living soap opera). Although it's great to have lots of heartfelt advice—from magazines and the internet—it's often contradictory or falls into the 'dump him' or 'all men are cheaters' category. Obviously, that's not much help if you still love your husband and desperately want to save your marriage. I knew I had to write a book targeted specifically at women, when I counseled one couple where the wife was so consumed by anger that she could not hear the underlying messages from her husband. Certainly, on the surface, they sounded bleak: 'I don't know what I want' and 'I'm not certain that we can rescue our marriage.' He had also moved out of the house because he couldn't stand the rows anymore. In their counseling sessions, the angrier she became the more he disappeared into his shell. The less he said, the more her overactive imagination stepped into the breach. Instead of asking what he felt, she told him what he felt (and found the most negative interpretation possible). Not surprisingly, her husband either became defensive or thought 'what's the point' and in the counseling sessions he clammed up, and during the rest of the week hung up the phone on her or walked away. However, when she was calmer, she began to interpret everything in a slightly more nuanced way. When he said 'I don't know what I want,' she could reply 'I'm not certain either because all this is doing my head in too' and we were able to build a small bridge toward recognizing their similarities and starting to work as a team. At this point, she could also look past 'I'm not certain that we can rescue our marriage' to something more positive: 'we are still talking and actively trying to turn this relationship around.' However, all too often her righteous anger (because she had been hurt and rejected) would often tip over into ranting (which simply made her husband clam up again) and her helpful desire to understand would tip into overanalyzing (which made her either panic or despair). All too often, a breakthrough in resolving a tricky issue—for example weekend access to the children—would be undone during the week by her fears and anxieties. At this point, I realized that she needed not just weekly counseling but coaching too. So what's the difference? Counseling is about helping someone open up, explore their feelings, and ultimately to find their own solutions. It works best when the peak of a crisis is over and the dust has settled a bit. However, my female client did not need to 'get in touch' with her anxiety, but to manage it better. And that's where coaching comes in. Coaching is about sharing knowledge (gained from previous experience in the trenches of a problem). It offers practical suggestions and helps you to rehearse your messages to your partner. Ultimately, coaching is about keeping you calm, focused, and stopping you from turning a crisis into a disaster. Ultimately, it doesn't matter if you read Part One of this book or I Love You But I'm Not in Love with You first. However, if you're holding both in your hands (or have them on your e-reader), I would read I Love You But I'm Not in Love with You first. It provides a good introduction to many of the techniques that I will be using in this book but, more importantly, I would like you to read it before handing it over to your husband. (If he's not a reader, I have recorded an audiobook version.) In this way, if he is willing to read or listen to it, you'll be able to discuss any points that he raises and do the exercises together. Moving onto Part Two of the book where I look at whether there's another woman on the scene and how to combat her influence, it's six years since I wrote How Can I Ever Trust You Again? to spread the word that marriages can recover from infidelity and couples can build stronger and better relationships. To be honest, I thought I'd covered almost everything that needed to be said about infidelity too. However, I still worked for Relate and we tended to see people after the immediate crisis had passed. In other words, the affair had been discovered but the couple were committed enough to their relationship to book an appointment and go on a waiting list, before finally starting work with me. I hardly ever saw people right in the eye of the storm: unsure whether their partner would stay or go or whose partner kept denying there'd even been any wrongdoing. However, desperate letters to my website told of the drama of packed and then unpacked bags, the gut-wrenching pain of being home alone while your partner was out womanizing, and the frustration of knowing that something distasteful was happening while your partner was flatly denying it. Many of my correspondents were having counseling—and it helped take the edge off their pain—but they needed something more. They each wanted to understand what was going on inside their partner's head; they needed advice on how to communicate more effectively and how to keep calm while the world was conspiring to turn them mad. In other words, they needed coaching as much as counseling. There's another reason why I've decided to write this book. My casebook for How Can I Ever Trust You Again? was based mainly on infidelity in the late 1980s and early 1990s. For much of that time, it was easier to draw the line under an affair. Cell phones were rare and the internet was something for geeks. However, in the years since I wrote the book, smartphones have become standard and social networking has taken off and added a whole new complexity, with the affair partner (or ex-affair partner) able to come into your home at any time—via text, email, tweet, or Facebook message. With 24/7 communication, if your partner's resolution slips for just a moment, he can be in contact instantly with the other woman and your marriage drops down into a fresh circle of hell. So while in the past, the journey to recovery might have been stop-and-start, today it can seem like you're constantly being sent back to the beginning (or never even leaving it). Although I don't have any easy answers, I can break your problems down into more manageable chunks. I can help you to keep hold of your sanity, can explain your options and advise on when to make a strategic withdrawal and when to fight on. If the affair has supposedly ended, I would read How Can I Ever Trust You Again? first—even though you suspect or fear that your husband and the other woman are still in contact. It will give you a better idea of the journey ahead and of whether the pitfalls are part of the natural recovery process or because the affair has been rekindled. If your partner will not admit to an affair, has confessed (or made a partial confession) but doesn't know what he wants, or is determined to leave with his new 'love,' please start with this book because it focuses on finding a way through an immediate crisis. 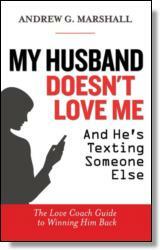 Although this book is called My Husband Doesn't Love Me and He's Texting Someone Else it will help even if there is not another woman involved. It's perfectly possible that your husband feels that his life has hit a brick wall, he's tried to sort out his un­happiness and you've either failed to hear how serious he is (and despite trying harder everything's slipped back to normal) or he's kept his problems to himself. Perhaps he's depressed and feels leaving and starting again is the only viable option. However, over the past thirty years, I've counseled thousands of men and women who have fallen out of love and, while only a minority of women are involved with another man, the majority of men are 'getting advice' or 'involved' to some degree with another woman. Some husbands will have stepped over the boundary from imagining what life might be like with her into sending flirty texts, developing an emotional attachment, or even starting a full-blown affair. Whatever the circumstances, it still feels incredibly bleak: he doesn't see a future together, he wants to tell the children, and to split up your happy family. Fortunately, I have a message of hope. It is possible to turn around your relationship and build a better and stronger marriage. However, it is important that you stay calm, listen to what he's saying, and not let overthinking turn a problem into a full-blown crisis. So even if there is another woman on the scene, please don't skip Part One, because it will explain how you got to this point—and the building blocks for rescuing your relationship are the same whether there is someone else or not. If you just suspect another woman, please give your husband the ­benefit of the doubt while you're reading Part One, since it will make it easier to step into his shoes and understand him. It will also help you to take this situation not quite so personally. OK, I know that's a tough ask. Of course, it feels personal: he doesn't love you. But this crisis says just as much about him: how he deals with problems and conflict, and how he was brought up. I know it's hard to feel compassionate toward your husband—especially as you long just to shake some sense into him—but it will pay dividends. If you can be kinder to your husband, you are also going to be kinder on yourself too and that's important because the journey is going to be tough. If your husband has spoken up before his unhappiness tipped over into some form of betrayal or you've spotted the problems early enough to nip it in the bud, there is no need to torture yourself by reading Part Two. If you are unlucky enough to find your husband has become emotionally attached to another woman, Part Two of this book will prove invaluable. If it's another man, I've written a special appendix, which includes other women's experiences and my advice. I have used the word 'husband' rather than 'partner' in the title because I wanted to immediately indicate that this book was targeted at women. However, let me be clear: this book is for all women in committed relationships—whether married or not. I have also had to make some blanket statements about men and women—even though I know there are countless exceptions. Having said that, there is often truth in generalizations. So even if something strikes you as 'yes but …,' please be patient with me because even if you don't fit precisely into this category, it will ­illuminate how you might be coming across to your partner, and sometimes an extreme example will demonstrate more clearly what may need to be changed. ©2015 Andrew G. Marshall. All rights reserved. Reprinted from My Husband Doesn't Love Me and He's Texting Someone Else: The Love Coach Guide to Winning Him Back. No part of this publication may be reproduced, stored in a retrieval system or transmitted in any form or by any means, without the written permission of the publisher. Publisher: Health Communications, Inc., 3201 SW 15th Street, Deerfield Beach, FL 33442.